Zoning Planner Keith Berkhout spotted this photo, which was forwarded to Kane County Connects from Development Director Mark VanKerkhoff. 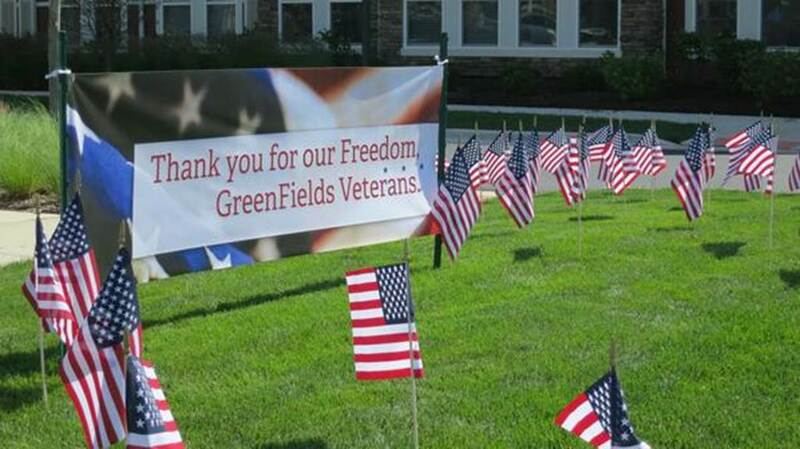 It’s simply a photo taken at Greenfields of Geneva, a retirement community in the Mill Creek area, that thanks the veterans who live there. We’re posting it here because it’s a terrific reminder for Independence Day, and just a nice thing to do, but we’re also hoping that this is the first of many photos people send to Kane County Connects for publication. The more, the merrier. For now, we’ll call this feature “Out & Around Kane County,” as a kind of tribute to the “Out & Around” feature Allen Mead ran in The Geneva Republican for so many years. The idea is, you see something of interest anywhere in Kane County — a special moment, a breaking news item of interest, a beautiful piece of scenery, a weather event, a community celebration — you take a picture (or pictures) of it, and we’ll share it with a wider and fast-growing audience. The purpose of Kane County Connects is to, well, connect. We’d like to help you do that. Email photos to ricknagel23@gmail.com, and please put “Out & Around” in the subject line. ← ASK MARK: My Granddaughter Lives With Me, Does Her Income Count Against a Senior Homestead Exemption?